Ritual. We studied it, we practiced it, we analyzed it. Great ritual, we were taught, creates lasting memories, stories that live for years. Learning to create ritual was part of my rabbinic training, and my teachers were awesome architects of the same. Naturally, one wants to live up to one’s teachers. Last week, a young woman in my congregation went before a beit din, a panel of three rabbis to complete her conversion to Judaism. Big ritual. Huge. I prepared with care for her beit din and for her mikvah, the ritual immersion that formally completes the process. I had a beautiful tallit at the ready, a prayer shawl in all her favorite colors. Between her beit din and the mikvah, we would go out to dinner and before our meal I would lovingly lay the tallit on the table. She and her three witnesses would tie the tzitzit, the ritual fringes at each corner. The tying would be a spiritual practice and gift. We would wind and knot threads with our blessings and hopes. It would be heartfelt, prayerful, lovely. Then we would travel to a nearby lake, where a family had kindly offered us the use of their dock for the young woman’s mikvah. We would recite blessings I had crafted especially for her. Women supporting each other, co-creating a ritual we would all remember the rest of our lives. One of the women got lost finding the restaurant, which had failed to turn on its neon signs. I talked her back to the right intersection on my cell phone, standing on the corner, jumping up and down and waving both arms frantically. When she got out of her car, a stream of unprintable things emerged from her otherwise calm and pragmatic person. Then I called the last woman who is chronically late to everything. “I don’t know where I am,” she answered. I repeated my routine, hoping no one would recognize the small, hopping woman on the corner as the rabbi of Temple Or Olam. Later, I laid out the prayer shawl in the near empty restaurant on an empty table. I began leading us through winding and tying. I asked the women to silently weave their prayers into the tzitzit. Ahh, I said to myself. This will be wonderful. Sweet. Transcendent. While I was explaining, one of the woman got her threads twisted up and started joking about being handicraft challenged. Then the food arrived, and I had to find a way to keep the tallit from getting immersed in balsamic vinaigrette. Later, we piled into one of the cars to make the drive to the lake. It was only minutes away. We got lost almost immediately – despite Google maps. There were many u-turns and a close encounter with a car with flashing blue lights. Finally, we found the house. We climbed out of the car and began traipsing over the lawn, which, despite the terrible drought, was both very long and very wet. Sprinklers? Condensation from the lake? Suddenly, the young woman told us in a small voice that she was actually terrified to get into that lake and that she hated nature and that there were bound to be live things, including fish, in the water, and that the lake bottom would be nasty and muddy, and and and. The other women attempted to comfort her. “You’ll be all right,” said one. “It will be fine,” added the other. Our young woman kept describing the horrors that awaited her. We rounded the house and walked toward the pier, the small flashlight in my hand shedding insufficient light. We were nearly at the water’s edge. “Omigod,” I said, in utter disbelief. All of us saw it, despite the dark. Between the small flashlight I was carrying and the lights from the house, we couldn’t miss it. 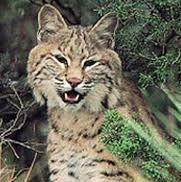 A bobcat. He stood stock still, staring right at us. Gingerly, we walked half backwards onto the pier, hoping the thing would go away. “Is it still there?” one of the women asked. It has gone away, I told myself, as the young woman climbed into the water. She began frantic movements in the water to scare away the fish. She was thinking of the fish. I was thinking of the bobcat. I asked everyone to breathe deeply. Somehow, we regained our sense of place and, after nervous giggles and anxious interjections from our young woman, we read our blessings in turn. She slipped back into the water a last time. She emerged. We chanted the Shema and the Shehechiyanu softly in the moonlight, and wrapped her in the towel and the tallit. We walked back down the pier and sighed with relief; we did not see the bobcat. We got lost all over again going back to the restaurant parking lot. We laughed and mazeltoved and drove home. There was, I admit, some residual anxiety on my part. When I got home it was nearly midnight. Nevertheless, I asked my husband, Ralf, to google pictures of bobcats. “Yes, it looked like that nasty, scary one right there!” I said. “Were its ears forward?” he asked. “I… I think so,” I answered. “But I was already scared!! !” I protested. “Don’t worry everyone, found out this morning it was simply a statue in the backyard to SCARE THE GEESE!!! Thanks again for being there last night. I wouldn’t have wanted it any other way. I had dreamed of this beit din for a long time. For weeks, I had imagined us at the pier in sweet darkness, women alone and prayerful, conscious of our strength and our joy. The real world played tricks on my dreams. There were so many emotions I never imagined. Aggravation and impatience at getting lost again and again. Unexpected and unknown fears. Giggly and giddy lightness. “This is one crazy mikvah story,” one of the women said. “I don’t think we will forget this one,” I said. It was late last night. I passed by my son’s bedroom. Erik pointed to his computer screen. He was reading an article on male lactation. “There’s a story in Talmud about a man who breastfeeds,” I said. At this point my husband, Ralf, turned round the corner and speculated on whether I had been drinking something I shouldn’t have. I admit it: My congregation gives me grape juice for leading Kiddush, as I will get quite silly after consuming two tablespoons of Manischewitz. And yes, I know that Manischewitz is not wine. But it does count as alcohol. Really. Well, at least for small children and me. The Talmudic text in question (Shabbat 53b) makes for interesting reading. In it, a poor man’s wife dies, leaving him with a nursing child. He can’t afford a wet nurse. A miracle occurs and his breasts “open,” allowing him to nurse his own child. The rabbis, as always, proceed to discuss the matter. Rabbi Yosef exclaims that the poor man must be a great guy, a real mensch. That explains the miracle. Rabbi Abaye is of the contrary opinion. The fellow must be a real schlemiel. Otherwise, divine intervention would have focused on helping him find a job so he could afford to pay a wet nurse. Instead, he got slammed with a solution that did the humane thing by keeping the kid alive but could only have afforded major embarrassment. (Men are not encouraged to be women in the Talmud…). Rabbi Yehuda insists that it’s pretty hard for heaven to change the fate of a man when it comes to job searches and a lousy economy. Rabbi Nachman concludes the discussion by stating firmly that a miracle did occur no matter how you shake it, but that one must admit that the guy did not get gainfully employed. Lack of employment isn’t so good in any age. You gotta love Talmud. You really do. You can find more about male lactation in rabbinic texts. Genesis Rabbah (30:8) features the rabbis speculating on the weaning of Queen Esther after both parents died. Mordecai is a prime candidate for male lactation and the survival of his niece. It’s good to have a loving family. There is a scientific explanation for male lactation. You can read all about the hormones that can cause men to get happy and produce milk. I have also learned that extreme stress combined with strenuous physical activity and a shortage of food can cause male lactation. Hmmm…. Poor guy + hungry baby = extreme stress. Tada!!! Male milk! I mean, why not? That’s exactly what happens to women! Ralf had left the room. Probably, he had better things to do. You learned something from all this, I am sure. Put War and Peace away. For entertainment, just read the Talmud.